BestCan Windows, Doors and Home Renovations of Ottawa was delight to receive this press release from Vinylbilt earlier today. We are excited to announce that Vinylbilt has partnered with world class supplier Cardinal Glass Industries to offer you sealed units that are internationally recognized for their high quality and durability. Our glass still comes with the same great features like Simply Clean and Low-E, and still has the same great energy ratings, but now our insulated glass units are equipped with Cardinal’s EndurIG™ spacer bar. THAT WAS A LOT OF TECHNICAL JARGON! LET’S BREAK IT DOWN. SimplyClean is our self-cleaning glass coating that helps to keep your windows stay cleaner longer. Check out the blog about Self Cleaning Glass for more info! Low-E is short for low emissivity. Low-E glass has a microscopically thin coating that helps to boost the insulating ability of your windows. Check out the blog about Low-E for more info! Insulated glass is made up of two or three panes of glass that are separated by a vacuum sealed air space that can be filled with air or special gases like Argon and Krypton. This helps to control the transfer of heat and cold across the window, and increase the energy efficiency of windows. Spacer bars are what bind two glass panes together in order to create an airtight cavity. Cardinal’s Endur IG™ Spacer Bar is a warm-edge, stainless steel spacer that provides long-term performance. It delivers the industry’s lowest failure rate and provides outstanding thermal performance and solar control. Minimizes moisture permeation, is UV resistant and provides an outstanding Argon barrier. Superior resistance to moisture, temperature, and ultraviolet radiation versus organic sealants (polysulfide, hot melt butyl, and polyurethane). The extraordinarily thin 0.0025” corrugated top significantly reduces heat conduction along the top of the spacer, improves performance, and is extremely crush resistant. 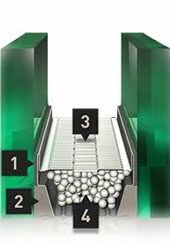 High adsorption 3A molecular sieve beads provide an increased dessicating capacity compared to many other spacers; higher desiccant capacity equates to longer life. To order windows with the new Endur IG™ spacer bar, contact BestCan today!